After a lot of procrastinating I finally got around to playing the new Domino’s game. After all if it’s something that will help you earn Pizza points how could I refuse? It’s definitely got a little effort put into it but I wouldn’t say that the game is all that amusing. I don’t see myself ever replaying it after all. Still, if you’re looking for a motion game where you have to move carefully through the obstacles then this will be right up your alley. There are 6 levels here and each one is a little different. For example one of them plays out like a Monkey Ball level as you try to avoid the holes in the ground and roll to the goal. It’s probably the most well thought out level. I’ve always liked that game series as it can get quite difficult but never unfair. Some points in this level are incredibly difficult but fortunately there are constant checkpoints so you never have to go too far back. That’s something that I definitely appreciated from the game. Without the checkpoint I’m sure that the game wouldn’t have been nearly as enjoyable. Another level has you controlling a balloon as you glide from place to place. It’s a pretty interesting concept as you use the fans to keep it on course. It seems difficult to win this level without dying though as the balloon has a tendency to get into bad angles but fortunately the checkpoint fixes that. Next to we have a level where you manipulate really small balls to try and go down the tunnel. You have to get 10 balls into the correct hole in multiple phases. It’s a pretty fun level although it’s also rather easy as you appear to have an infinite amount of balls. The level is less interesting than the last 2. The most bland level in the game is probably one where you have to roll sideways from platform to platform. You’ll certainly get there eventually, you just gotta keep going. There’s also a 3D roller where you move from side to side. It’s pretty similar to the Monkey Ball level but with less control so it’s not quite as good. Still not a bad level though. As far as the graphics go the game looks okay. It’s like what you would expect from a tech demo or something. The colors are clear and everything looks as it should but the actual objects are super basic. Nothing wrong with that but of course it does make it fairly easy for the graphics to look good so don’t go thinking that it’s because this is a AAA game or anything. There isn’t really a soundtrack here. There is one static theme that keeps showing up a lot but that’s about it. It’s fairly calm and peaceful though so it fit the levels well. Let’s talk about the real trouble here though. There is basically no replay value to be found here. That’s because the 6 levels is all the content in the game. You can’t earn any extra rewards either so the only possible reason to play the games again is to increase your star rank. I don’t know about you but I don’t think that is a good enough incentive to keep me playing. The game is free so it’s not like you lose any money but make no mistake, you’ll only be playing around for about 10 minutes and then after that the game will be over. 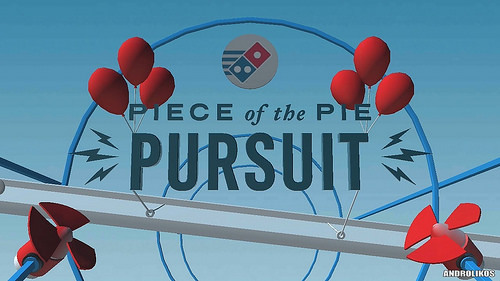 Overall, It’s cool that Domino’s made their own game. All things considered I think that they put a decent amount of effort into it. As most people will be playing it for the coupon I’m glad that it doesn’t take too much effort to get it. It’s not a game that I expect I will ever play again but I’d recommend downloading it. Pizza doesn’t get much better than Domino’s so this coupon is definitely pretty handy. This entry was posted in 5 Star Games, App Games, Game Reviews, Games, Reviews and tagged App Game, Domino's Pizza, Free to Play, Game Review, Mobile, Mobile Review, Piece of the Pie Pursuit, Review, Video Game Review by dreager1. Bookmark the permalink. Can I win a chicken sandwich? Yes, a Chicken Sandwich is eligible as well. Although, to be precise you would win 1/6th of a Chicken Sandwich. You would still have to order from Domino’s 5 times with the rewards program to actually get the coupon for a free chicken sandwich. So….after you buy 5 chicken sandwiches (Has to be separate orders) then you will get the free one.